Crock Pot Vanilla Sour Cream Cake - Recipes That Crock! Yummy yummy in my tummy! 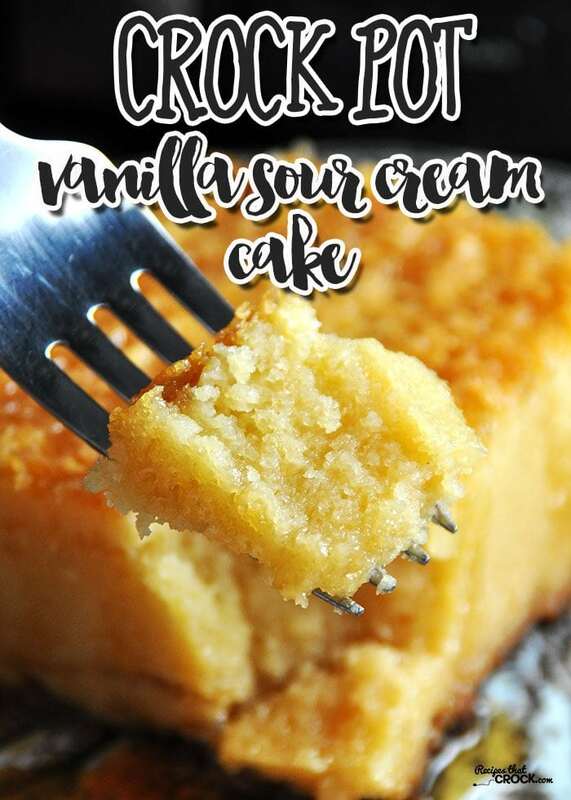 This Crock Pot Vanilla Sour Cream Cake is the perfect treat for a weeknight meal, pitch-in or holiday meal! You are gonna love it! The original recipe for this cake called for cooking it on high for 4 hours. However, mine was done between an hour and a half and two hours, so the first time you make this delicious cake, watch it closely to see how your crock cooks it up. If you don’t like sour cream, don’t worry. You won’t taste it. It just serves to make the cake super moist and yummy. I used good ol’ Sir Hamilton (my Hamilton Beach Programmable Insulated Slow Cooker). 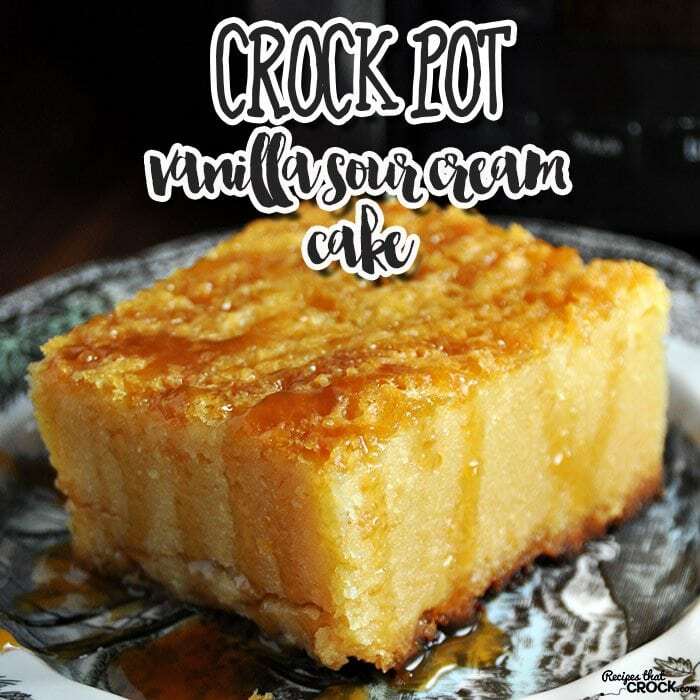 I knew I could count on him to cook Crock Pot Vanilla Sour Cream Cake evenly…and boy did he deliver! If you don’t have your own Sir Hamilton (I highly recommend that it be your next crock pot purchase! ), you can use a 6-quart slow cooker. I haven’t tried it any other way than as described above. I am a big believer in moderation, so if this is too tempting to have around the house, I would make it for a potluck, family gathering/company or even make it and take the leftovers into work so that I could have my cake and eat it too… just not too much ;). Cant wait to try this also wondered could this be baked in regular oven in a bundt pan ??? I haven’t tried it, but if you do, let me know how it goes! Enjoy! First off Thank You for all the wonderful recipes. So far I have loved them all. I have this one in my crock right now. I had white cake mix and only chocolate pudding and chocolate chips so it’s a little modified but i think it will be great. Since that’s all I had on hand and craving something sweet. I will try with your ingredients also as I love vanilla cake too. I love trying out different variations with a “base” recipe. Enjoy! Sounds delicious….but I am not a fan of white chocolate at all. Would choc chips work as well? As a matter of fact, I do not like white chocolate. It may affect the color but I would think it would work otherwise. Thanks. Where can I find a recipe for the caramel drizzle? For the caramel drizzle, I used the Kroger brand caramel ice cream topping. It worked wonderfully! Enjoy! Would this be adaptable to the casserole crock pot? My favorite, I might add. I love my casserole crock pot too! I haven’t tried it in my dear Cassie yet, but I think it would work well. Make sure you watch it closely the first time so you know if the time needs adjusted when making this in a casserole crock. Enjoy! Do you put the lid over the paper towels or just cook with the paper towels on top. Also can you substitute the vanilla chips for chocolate. Yes, put your lid on top of your paper towels. The paper towels are only there to keep condensation from dropping on top of the cake. I have not tried it with vanilla chips, if you do, let me know how it turns out! Enjoy! OMG!!!!! I think I have fallen in love!!! Have you tried it yet? I love it too! Enjoy! Can this be prepared in a casserole crock? I have not tried it, but I think it would work well. Make sure you watch it closely the first time so you can know how your casserole crock cooks it. Enjoy!